Dynamic Reports for Excel (XLRaider) allows the import of structured data from Excel source files to create dynamic reports with relational comparison and consolidation. 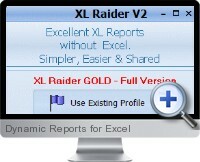 The application is independent of Excel and doesn't require Excel to be installed. Professional and dynamic reports including charts can be quickly created and published for distribution. The dynamic report creation process does not require knowledge of data cubes, ODBC connections or pivot reports as the user interface employs an easy to apply wizard approach. Wizard interface is intuitive and efficient. Save dynamic report details and load from saved profiles. Choose between basic and advanced dynamic report building options. Predefined analysis and comparison templates profiles expedites reporting building process.